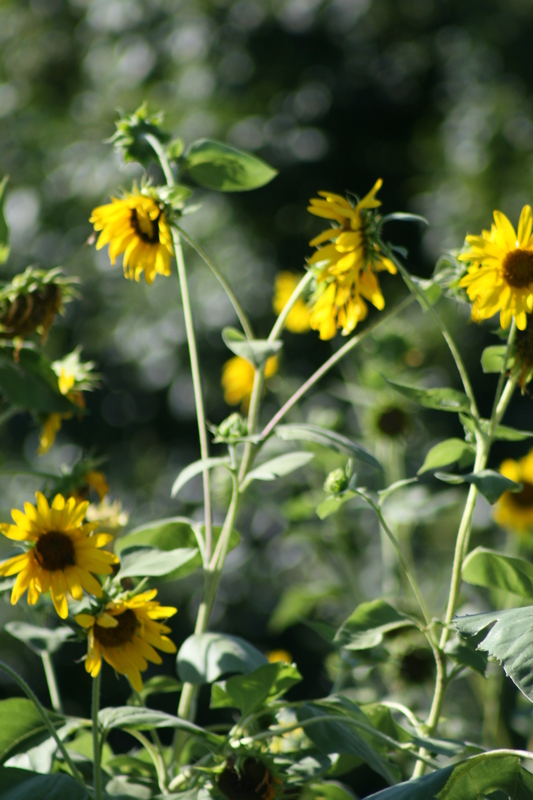 I just have to photograph my sunflowers… every year! Today was beautiful!! I’m talking clear, blue skies with sun shining, warming up things to a mere 90 degrees. A lovely breeze blowing, causing my wind chimes to break into their soprano and baritone tunes. The water from the pool reflected by the sun into the tree, fairies flitting in and out of the leaves. The pool water wasn’t too cold or too hot, Goldilocks-just-right. The black soprano wind chime was given to me when my mom died, and the silver baritone is the one I bought when James died. A day all to myself. 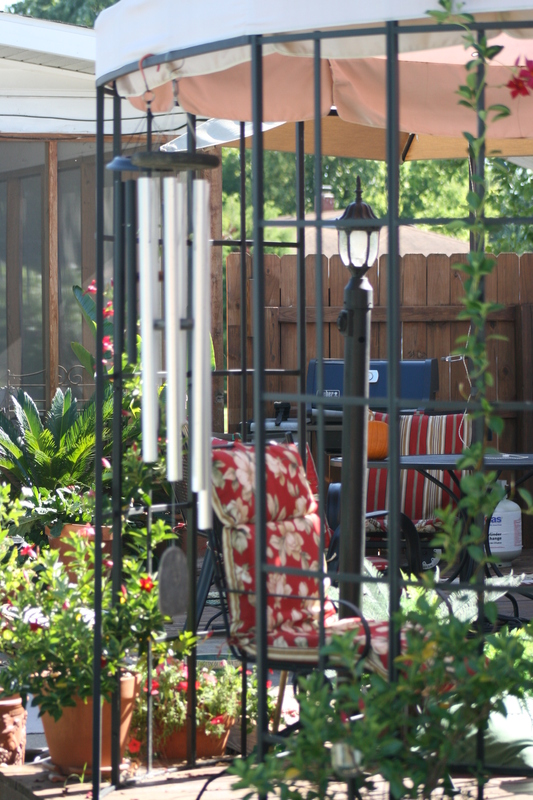 Working in the yard; jumping in the pool; picking up the camera to shoot some pics of my oasis; eating popcorn and drinking pop. Thanking God for His blessings to me; asking Him to bless others; listening to His peace. 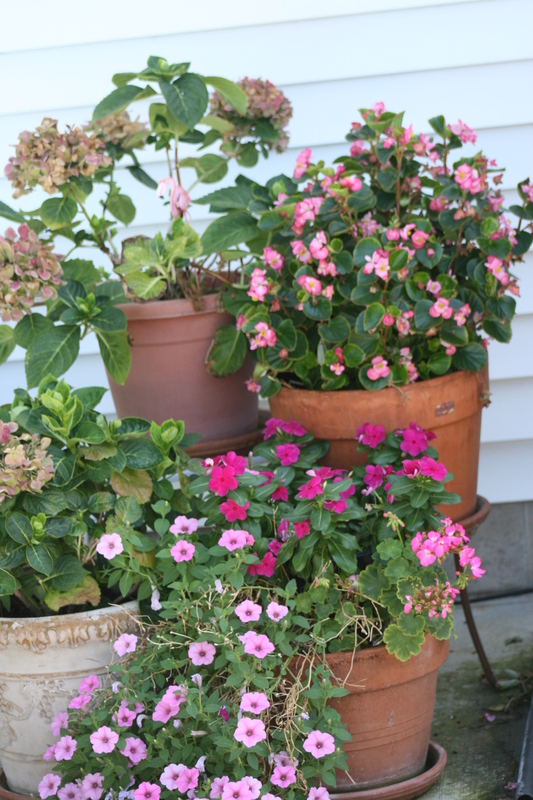 The flowers were popping with color as were some of my little visitors. 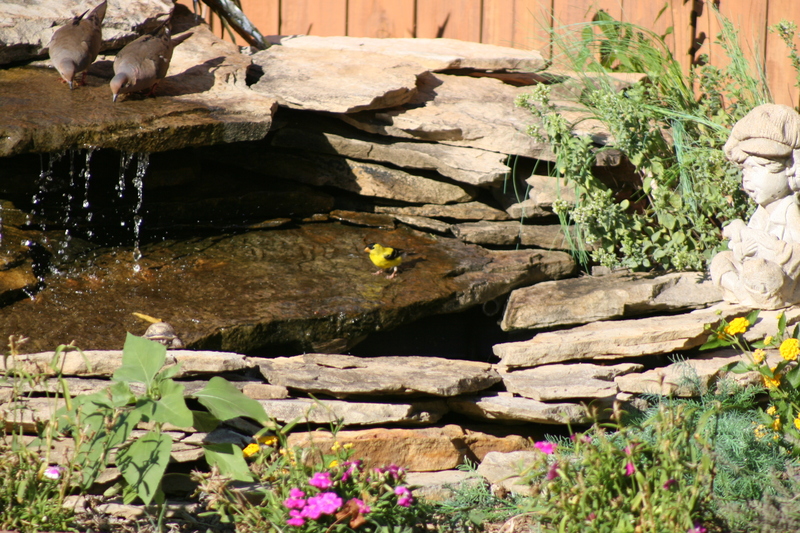 There are three hummingbird feeders in the yard, but the main attraction is the small pond and waterfall. 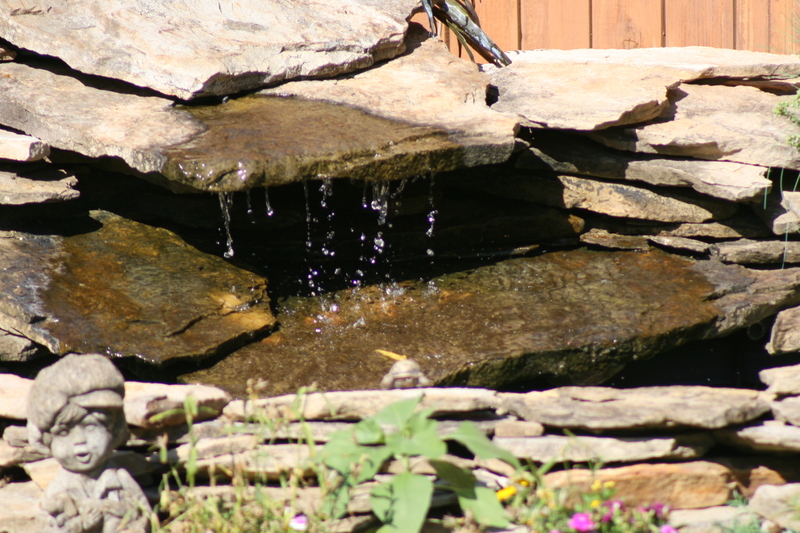 I love to listen to the trickle of the water. 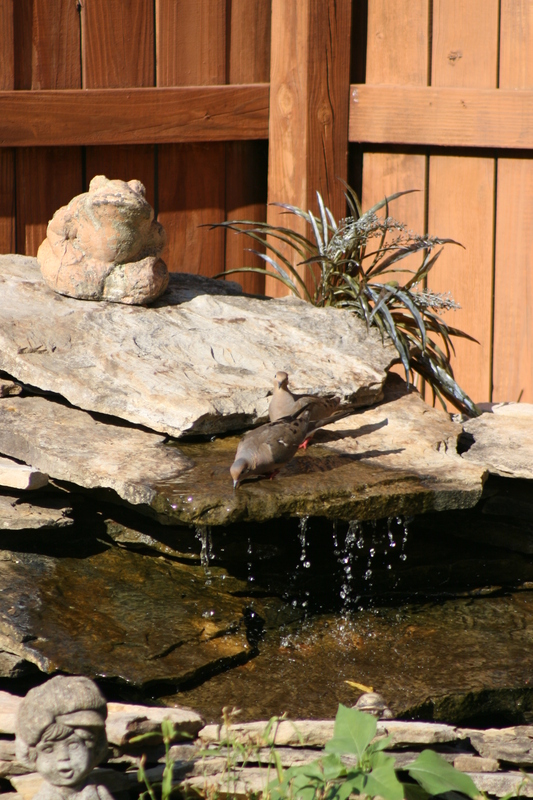 The birds love to come and get a drink, so sometimes I try to snap their picture. A pair of doves came by and visited a spell. 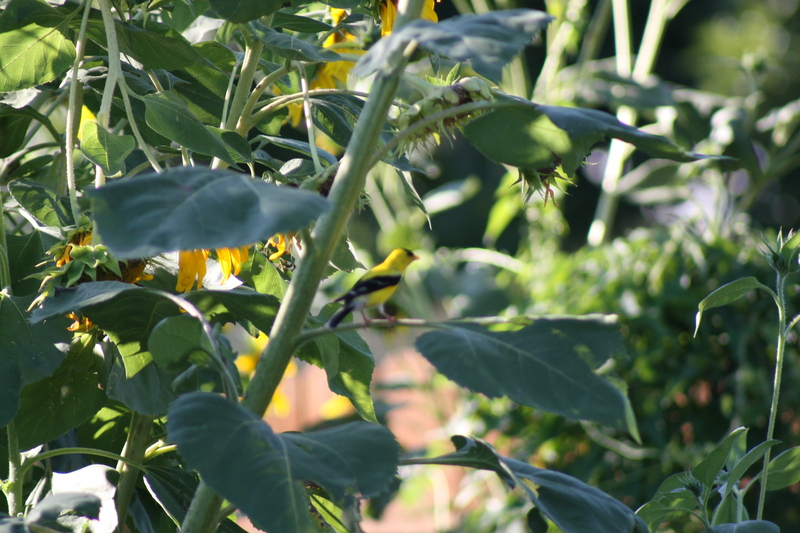 They stayed quite a while and were joined by the little goldfinch. I’ve been noticing it because of its bright coloring. Just a tiny little thing that loves to sit on the sunflowers for a tasty meal. 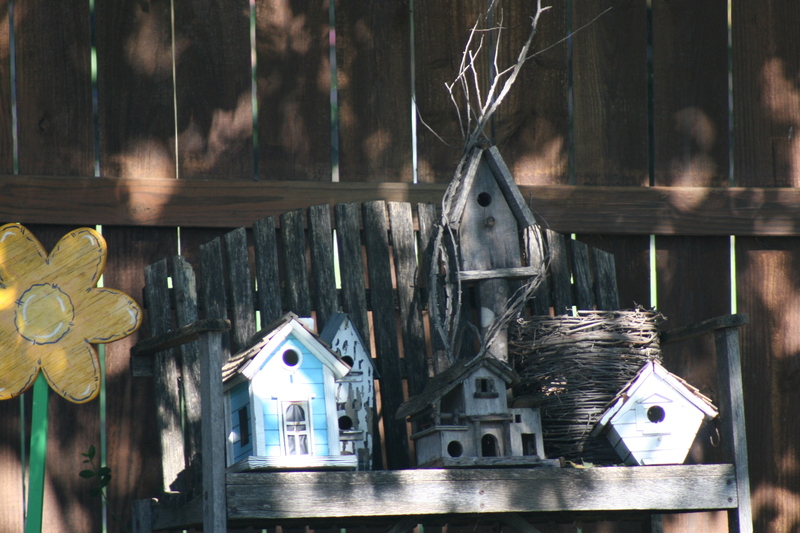 This year has been a great year for birds: barn swallows, of course; blackbirds, of course; lots of lovely cardinals, beautiful robins; hummingbirds, doves, and all these little finches. 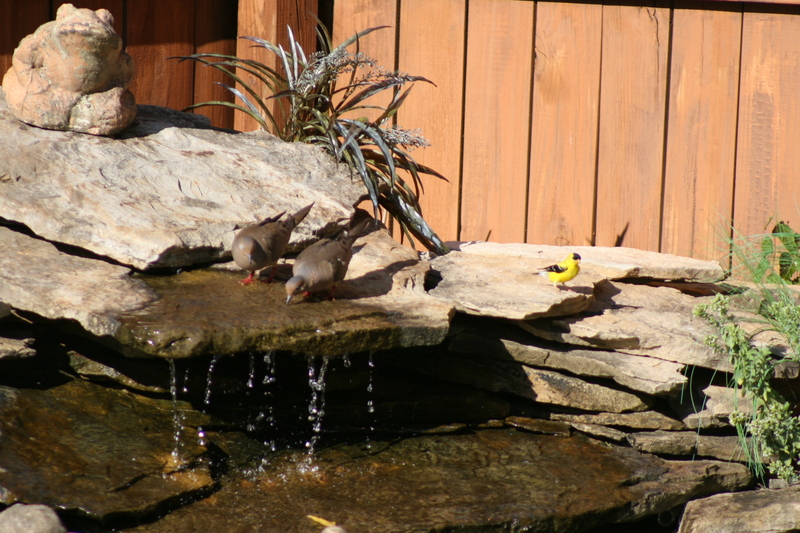 All colors of finches. I have so enjoyed watching them flit around the yard. One day when the grandgirls were here, Kate said, “Look at that huge dragonfly!” It was a hummingbird. So funny. 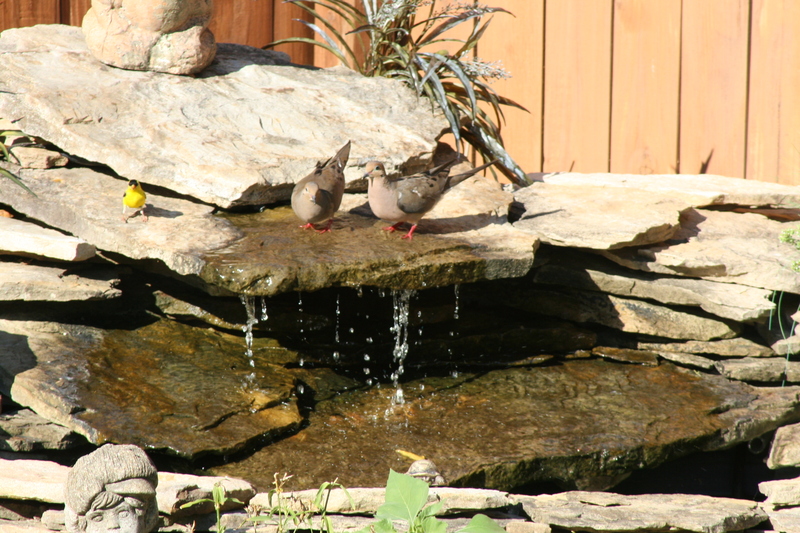 The one dove has spotted my little finch and giving it the eye! I just couldn’t decide which pics to put on here, so you get them all. I can’t help myself. They’re like my children!! I’m going to put this in my wallet. Nobody lives here. A bird ghost town. What a beautiful oasis. I can almost hear the water trickling. Thank you for sharing.